In August 1947, Diana Athill travelled to Florence by the Golden Arrow train for a two-week holiday with her good friend Pen. In this playful diary of that trip, delightfully illustrated with photographs of the period, Athill recorded her observations and adventures  eating with (and paid for by) the hopeful men they meet on their travels, admiring architectural sights, sampling delicious pastries, eking out their budget, and getting into scrapes. 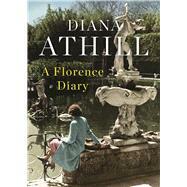 Written with an arresting immediacy and infused with an exhilarating joie de vivre, A Florence Diary is a bright, colourful evocation of a time long lost and a vibrant portrait of a city that will be deliciously familiar to any contemporary traveller. Diana Athill was born in 1917. She helped Andre Deutsch establish the publishing company that bore his name and worked as an editor for Deutsch for four decades. Athill’s distinguished career as an editor is the subject of her acclaimed memoir Stet, which is also published by Granta Books, as are five volumes of memoirs, Instead of a Letter, After a Funeral, Yesterday Morning, Make Believe, Somewhere Towards the End, and a novel, Don’t Look at Me Like That. In January 2009, she won the Costa Biography Award for Somewhere Towards the End, and was presented with an OBE. She lives in London.